Older Freighters in Danger of Going Back to the Desert Again? Old timers call them aircraft boneyards, when referring to the massive areas allocated in U.S. deserts for the storage of aircraft which are no longer serviceable or which have been temporarily placed there by carriers who may still want to bring them back to life at a later stage. During the past decade many older Boeing and Douglas freighters which are still serviceable were put there. Many are now back in service due to high demand - but for how long? 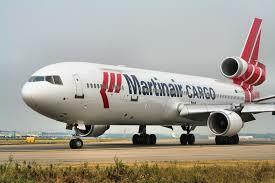 MD-11F – soon just as a model plane? There were a considerable number of the above aircraft ferried out to the U.S. desert parking spaces when air cargo demand went down some years ago and when newer Boeing and Airbus freighters came on the market which were much more economical to operate. This changed again a couple of years ago when air cargo demand picked up, started to boom and the market showed a twelve-month high demand and not just during the traditional last quarter of every year. The B747-400s and MD-11Fs came out of the mothballs and are now operating alongside their younger successors. On the other hand, Cargolux have announced that they intend to add a further two B747-400Fs back into the fleet next year as well as having Emirates SkyCargo return another -400F, which is leased to EK by CV, back to them. Cargolux is not alone in this as others such as Silk Way Airlines are doing the same. Is the fuel price going to kill the return of the B747-400F and MD-11F? When cargo operators got serious about returning older models to their fleets in order to cater for demand for space, the Jet-A1 aviation fuel price was just below US$1.60 per gallon. This low price compensated quite a lot for the higher operating (fuel consumption) costs for these aircraft. On top of that payloads are recording almost an average of around 80% - a good revenue and yield factor. The world has seen considerable upheaval since then and despite continued booming air cargo demand, politically place many question marks on the further development of world trade. The uncertainty has hit the crude oil pricing again and now IATA’s latest Jet Fuel Price Monitor indicates that the Jet-A1 price per gallon has risen in May to an average of around US$2.24 per gallon. Versus a month ago, this represents a further increase of almost 8% per gallon. IATA figures also show that with an average price of US$84 per barrel for oil, that the impact on the global aviation fuel bill for 2018 will be an increase of more than US$40 billion compared to what was indicated at the beginning of 2018. Is there a real danger that older aircraft will go back into the desert? Probably not at the moment as the market is buoyant, e-commerce continues to develop with leaps and bounds and shippers are clamoring for space either on regular cargo flights, belly holds of passenger aircraft or even trying to fix long-term charters with carriers in order to ensure they have guaranteed space. Carriers will have to consider hiking rates even further now as it seems that there is no danger in the near future that demand will drop and that, if this were the case, agents and shippers would demand lower rates again. The air cargo handlers also have their hands full in trying to cope correctly with all handling aspects of this growth. One can only hope that the carriers will also now honour this and not start putting pressure again on them to lower their handling rates. Handlers these days work on pretty thin margins and it is also time that they reap the benefit out of the boom. Fuel prices may well go up even further before the end of the year, but the demand has ensured that the old birds come out of the desert and it’s up to the carriers to see that a decent yield comes out of it. Maybe there will be some reprieve as the crude oil price dropped to under US$80 per barrel at the end of last week as Russia and Saudia Arabia said they would increase production. Question is, for how long? Anyway, it’s nice to see the older freighters in the skies again, although they are destined to go back into mothballs sometime.